Now that April 1 is well past, it’s probably safe to try this little diversion about something weird and wacky from the Middle Ages: the entertainment mechanisms of Hesdin Castle. 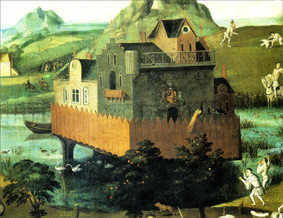 Also mentioned in other accounts were mechanical monkeys, a mechanical lion, and caged birds that spit water at people. The medieval sources describe these mechanisms as engiens d’esbattement (machines of amusement) or ouvraiges ingenieux et de joyeuseté et plaisance (ingenious works of joyousness and pleasure). Apparently, getting soaked with water and covered with flour, soot, and feathers was some people’s idea of a good time, in the Middle Ages as well as today, or at least the owners of Hesdin were fond of indulging in the well-known pleasure of pulling practical jokes on others. Count Robert II of Artois had, in his time, a high reputation as a military leader; Duke Philip of Burgundy was a prominent European statesman; but one gets the feeling that they would both have enjoyed a good waterfight, or one of those wide games where you run about throwing flour bombs at people. 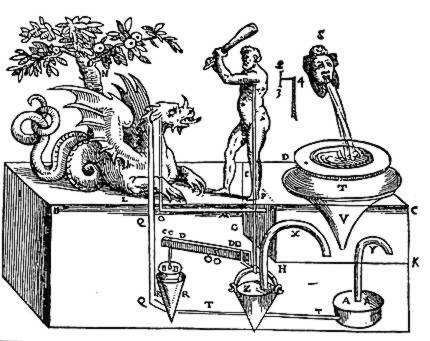 Giovanni Battista Aleoti's (1589) diagram of an automaton designed by Hero of Alexandria. Image on justhistoryposts blog. The great French poet and composer Guillaume de Machaut (c. 1300-1377), in his Remède de Fortune, assumes the voice of a distressed lover finding refuge in the park of Hesdin, where he is delighted by les merveilles, les deduis, les ars, les engins, les conduis, les esbas, les estranges choses (‘the marvels, the delights, the artifices, the automata, the watercourses, the entertainments, the wondrous things’ – translation by Wimsatt and Kibler, quoted by Kolve, p. 187). Here the amusements of Hesdin are marvels in a romance landscape. Indeed, Anne van Buren has argued persuasively that they were meant to be so, that Count Robert and his successors intended them to recall and imitate the magical devices of chivalric romance. Almost a century afterwards, the cloth merchant William Caxton visited Hesdin. Later, when he became England’s first printer, he described his visit to the gallery in the prologue to his edition of Jason; what had impressed him there was the ‘subtil engyn’ that created the artificial weather. And indeed, if one was interested in hydraulics, simple engineering, clockwork mechanisms, and the like, there must have been plenty of intriguing devices at Hesdin to enthrall the mechnically minded. It would be easy to see Machaut as the poetic romancer and Caxton as the hard-headed engineering type, typifying two diametrically opposed views of the mechnical marvels of Hesdin. But that would be a modern dichotomy. In the Middle Ages, a ‘wonder’ (Old English wundor) or ‘marvel’ (Old French merveille) could be a miracle performed by a saint, a natural prodigy like a bird that grows on trees, or an ingenious mechanical device. Guillaume is captivated by the engineering of Hesdin; Caxton explains that the indoor weather generator at Hesdin is an explicit allusion to the magical powers of Medea (‘her connyng & science’), whose part in the story of Jason and the Golden Fleece would have been depicted in the visual art of the gallery there. Technology was a product of human creativity, just as the natural world or supernatural events were products of divine creativity. The marvels of Hesdin created an uncertain environment in which any object might be a booby-trap and any action might result in discomfiture, but the designers of Hesdin presumably slid the emotional response to their work from fear to pleasure by making the consequences merely uncomfortable rather than potentially lethal; if you opened the trick window, something popped up and shot you – but with water, not with an arrow. They probably used techniques and devices familiar from military and agricultural engineering. Fundamentally, the purpose of these devices was to bring together reality and illusion. Indeed, the marvels of Hesdin were a late medieval version of what would be called, eight centuries later, ‘virtual reality’. Anne Hagopian van Buren has done probably the most extensive research on the castle and park of Vieil-Hesdin: see her ‘Reality and Literary Romance in the Park of Hesdin,’ in Medieval Gardens, ed. Elisabeth B. MacDougall (Washington, DC: Dumbarton Oaks, 1986), 115-134. Other discussions I have used include Merriam Sherwood, ‘Magic and Mechanics in Medieval Fiction,’ Studies in Philology 44 (1947): 567-592; Richard Vaughan, Philip the Good: The Apogee of Burgundy (London: Longman, 1970), 137-139; Mary Flowers Braswell, ‘The Magic of Machinery: A Context for Chaucer’s Franklin’s Tale,’ Mosaic 18 (1985): 101-110; and V. A. Kolve, Telling Images: Chaucer and the Imagery of Narrative II (Stanford, CA: Stanford UP, 2009), 185-187. There is also a fine discussion of the Hesdin automata, including the full text (in French) and translation of the 1432 maintenance bill, in E. R. Truitt, Medieval Robots: Mechanism, Magic, Nature, and Art (University of Pennsylvania Press, 2015), 122-137. Thank you for this fascinating entry. Are you aware of the important role the castle at Hesdin plays in Dorothy Dunnett's novel To Lie with Lions? It is the sixth in the House of Niccolo series. The protagonist, Nicholas de Fleury, is a master at creating machinery and toys and all manner of marvels, so Hesdin is a natural place for him to employ for his own ends. Highly recommended. Thank you very much for this tip. I have not read this novel by Dorothy Dunnett, but now it appears I should. You might also note the more serious role recounted in book four of Les Rois Maudits, where Hesdin is the heart (even more than Arras) of the county of Artois.